(ANNOUNCER)>> TODAY ON MUSCLE CAR, LEARN HOW TO MAKE A SINGLE TRIP TO THE PARTS STORE AND COME HOME WITH EVERYTHING YOU NEED TO PAINT YOUR CAR. OUR TRIBUTE CAMARO STEPS OUTSIDE OF THE COPO NORM WITH A JET BLACK PAINT JOB THAT TURNS THE SINISTER ALL THE WAY UP. HOMAGE TO ONE OF THE MOST LEGENDARY MUSCLE CARS TO EVER ROLL OUT OF DETROIT, THE '69 COPO CAMARO WITH THE ULTRA RARE ZL ONE FACTORY RACING BIG BLOCK. WE GOT OUR HANDS ON AN ANNIVERSARY EDITION ZL ONE 427, NUMBER 426 OUT OF ONLY 427 THAT WERE MADE. AND ONCE WE BUILT THE CAR AROUND THAT MONSTER POWER PLANT, KEEPING AS CLOSE TO THE ORIGINAL COPOS AS WE CAN, SHE'LL BE READY FOR SOME SERIOUS ACTION. (TOMMY)>> WE'VE GOTTEN TO THE POINT OF THE BUILD WHERE WE CAN START PREPPING FOR THE BODY WORK AND PAINT ON OUR COPO CAMARO. NOW YOU GUYS KNOW THAT YOU DON'T WANT TO DO A BUNCH OF MIXING OF MANUFACTURERS WHENEVER IT COMES TO PAINTS, AND HARDENERS, AND THAT TYPE OF THING. THAT'S JUST ASKING FOR TROUBLE. SO WE'RE GONNA STEP BEYOND THAT BY EMPLOYING THE ENTIRE BARRETT JACKSON RESTORATION SYSTEM FROM PREP AND PRIME TO COLOR AND FINISH. (STEVE)>> IT'S NOT ONLY A NEW SYSTEM, IT'S A NEW WAY TO BUY PAINT AND SUPPLIES. 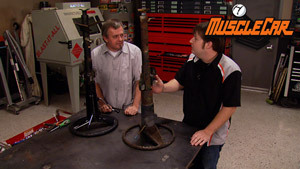 IT'S AVAILABLE IN LOCAL AUTO PART STORES AND YOU CAN GET EVERYTHING YOU NEED IN ONE PLACE. WORK WITH A DA SANDER AND AN AIR FILE. THE NEXT STEP IN THE PROCESS IS THE EPOXY PRIMER. THE PRIMER KIT CONTAINS THE COMPONENTS NEEDED TO MIX YOUR PRIMER FOR SPRAYING. EVERYTHING YOU NEED COMES IN THE BOX, INCLUDING THE PROPER HARDENER, MIXING CUP, AND EVEN GLOVES. IT'S AN ACTIVATED PRIMER THAT FEATURES A HIGH BUILD BODY, WHICH IS IDEAL FOR SANDING. AND LIKE EVERYTHING IN THIS SYSTEM, IT MIXES FOUR TO ONE. (STEVE)>> AS FOR COLOR, THE ORIGINAL COPO CARS WERE NO FRILLS, LOW OPTION MUSCLE CARS WITH ONE THING IN MIND, TO GO FAST. THAT MEANT THAT THEY OPTED FOR SOME OF THE TRIM PACKAGES TO BE LEFT OUT AND ALSO SOME OF THE STRIPE KITS. THAT MEANS THAT OUR CAR IS GOING TO BE ONE SOLID COLOR MOST OF THE WAY THROUGH. THEY HAVE 12 COLORS TO CHOOSE FROM AND THESE ARE THE FIVE MOST POPULAR. WE CHOSE A JET BLACK TO COAT OUR CAMARO. IT'S A SINGLE STAGE URETHANE THAT JUST LIKE THE PRIMER INCLUDES COLOR, AND HARDENER, MIXING CUP, STIR STICKS, STRAINERS, GLOVES, AND APPLICATION GUIDE, EVERYTHING YOU'LL NEED. TIME, INCLUDING THE CLEAR COAT AS WELL. GIVE YOU FIVE SPRAYABLE QUARTS OF MATERIAL, WHICH SHOULD BE ENOUGH TO COVER ANY AVERAGE CAR. (STEVE)>> ONCE YOU PUT DOWN THE PAINT GUN, YOU CAN FINISH UP WITH THEIR FINE GRIT ABRASIVES, THEIR MICRO POLISH, AND BUFFING PADS. AND TO MAINTAIN AND PROTECT THEY EVEN OFFER A COMPLETE LINE OF CAR CARE PRODUCTS WITH SCRATCH REMOVER, WAX, WASH, AND DETAILER. IT'S A COMPLETE SYSTEM THAT DRAMATICALLY SIMPLIFIES THE PROCESS OF PAINTING YOUR VEHICLE AND KEEPING IT CAR SHOW WORTHY. WE'RE GONNA SHOW YOU. WE BROUGHT BACK JASON ANDERSON FROM ANDERSON CLASSIC AND CUSTOMS IN CLAREMORE, OKLAHOMA, TO LEND A HAND WITH A PART OF IT. (JASON)>> SO WE'RE AT THE POINT NOW THAT THE CAR IS BLOWN OFF AND READY TO WIPE SOME PLASTIC FILLER ON. SO WE'RE GONNA MIX THAT UP AND GET GOING. ANY IMPERFECTIONS ON THIS QUARTER PANEL. 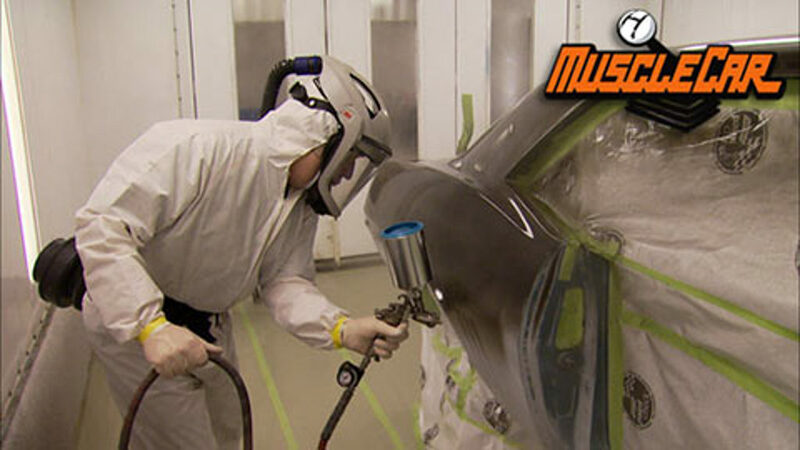 AS SMOOTH AS THE QUARTER PANEL IS, ALL YOU NEED IS A LIGHT SKIM COAT. IT DOES NOT NEED TO BE A QUARTER INCH THICK OR ANYTHING LIKE THAT. JUST ONE LIGHT SKIM COAT AND IT SHOULD TAKE OUT ANY OF THESE LIGHT IMPERFECTIONS IN THESE QUARTER PANELS LIKE THIS. YOU'LL BE GOOD TO GO. NOW THAT OUR PLASTIC FILLER IS READY TO SAND, WE'RE GONNA USE THE NEW BARRETT JACKSON 40 GRIT PREMIUM FILM ABRASIVE TO GET THIS SANDED UP AND READY TO PRIME. (TOMMY)>> JASON IS USING THE D/A TO ROUGH IN THE BODY WORK, BUT LIKE MOST THINGS IN CAR BUILDING, THERE IS MORE THAN ONE WAY TO SKIN A CAT. HE'LL FOLLOW UP THE D/A WORK WITH A BARRETT JACKSON SHORT BLOCK TO MASSAGE THE MORE CURVACEOUS AREAS. (ANNOUNCER)>> STILL AHEAD, KNOWING YOUR FILLER AND PREVENTING MISHAPS. WE CHECK FOR AND FIX AIR BUBBLES IN THE PLASTIC. THEN IT'S TIME TO START SPRAYING. (STEVE)>> HEY, WE'RE BACK. TOMMY AND JASON ARE OUT IN THE PREP BOOTH STILL PLUGGING AWAY AT THE BODY WORK ON OUR '69 CAMARO TRIBUTE CAR. PRETTY SOON THAT THING OUGHT TO BE READY FOR PRIMER. (TOMMY)>> WHAT WE PLAN ON DOING IS FINISHING UP THE BODY WORK ON OUR COPO CAMARO WITH SOME OF THE BARRETT JACKSON RESTORATION SYSTEM ABRASIVES. AND THEN WE'RE GONNA SPRAY ON SOME OF THEIR PRIMER IN PREPARATION OF COLOR. THE SANDING ELEMENTS THAT ARE PART OF THE SYSTEM ARE RESISTANT TO CLOGGING UP. WHICH IS ALWAYS BEEN A PROBLEM WITH TRADITIONAL SAND PAPER. THESE ABRASIVES ARE DESIGNED TO LAST UP TO FOUR TIMES LONGER THAN THE OLD SCHOOL STUFF. WHEN YOU GET A LITTLE BIT OF BUILD UP ON THE SURFACE JUST GIVE IT A GOOD SMACK AND IT CLEARS RIGHT UP. IT'S FOR FINER DETAIL AND FINISHING WORK. IT'S COMMONLY CALLED GLAZING PUTTY OR FINISHING PUTTY, AND YOU MIGHT BE ABLE TO SEE THAT IT HAS A THINNER CONSISTENCY THAN A HEAVY BODY FILLER DOES. LIKE COMPARING GRANULATED SUGAR TO POWDERED SUGAR. THAT'S SO IT CAN FILL PIN HOLES AND SMALL IMPERFECTIONS EASILY. LITTLE THINGS THAT YOU NEED TO WATCH OUT FOR, AND ONE OF THOSE ARE PIN HOLES. NOW A GOOD WAY TO DETECT THESE THINGS IS TO USED COMPRESSED AIR. SIMPLY TAKE AN AIR BLOWER AND BLOW THE DUST OUT OF IT. NOW YOU'LL FIND PIN HOLES WITH ALL DIFFERENT TYPES OF SIZES AND SHAPES. ONE THING I LIKE TO DO IS USE A PICK A KINDA DIG THEM OUT. THAT WAY WHENEVER I FILL THEM, IT FILLS EVENLY. IT DOESN'T COME BACK TO BITE ME LATER. AND THIS IS WHAT I WAS TALKING ABOUT. THIS IS JUST AN OLD PANEL THAT WE HAD SITTING AROUND THE SHOP THAT WE PAINTED, AND IT HAD SOME PREVIOUS BODY WORK DONE ON IT. AND ONCE WE RUN IT THROUGH A HEAT CYCLE. WELL IT HAD ONE OF THOSE BUGGERED UP SPOTS SHOW ITS FACE. NOW TO REPAIR THIS IT'LL HAVE TO BE SANDED, FILLED, PRIMED, AND THEN REPAINTED. AND NOW THAT'S A GOOD BIT OF WORK THAT COULD HAVE BEEN PREVENTED FROM HAVING ALL IN THE FIRST PLACE. NOW THAT'S KIND OF A BIG CRATER. SOMETIMES IT TAKES MORE THAN ONE WIPING TO DO IT, OR YOU COULD JUST GLOB IT ALL ON THERE AT ONCE AND THEN SAND IT ALL DOWN. (STEVE)>> WE'RE CLEAR OVER HERE FOR NOW. HOLD IT, TIME OUT, TIME OUT, TIME OUT! WE'RE LIKE FOUR FEET FROM THE DOOR. (TOMMY)>> PERFECT, BEFORE YOU CAN SPRAY ANYTHING, IT'S IMPORTANT TO MASK EVERYTHING OFF, MAKING IT AS TIGHT AS DRUM. AFTER ALL IT'S JUST AS IMPORTANT TO KEEP THE CONTAMINANTS FROM BLOWING OUT OF THE CAR ONTO THE PAINT SURFACE, AS IT IS TO KEEP PAINT OUT OF THE CAR. WE'VE GOTTA MASK UP THE OPENING OF THE DOORS AND THEN ALL THE WAY AROUND THE CAR TO THE FLOOR. (ANNOUNCER)>> IF TERMS LIKE POT LIFE AND OVERLAP MAKE YOU SCRATCH YOUR HEAD, THEN STICK AROUND AND LEARN ABOUT THE TIMETABLE YOU HAVE TO GET YOUR MATERIAL FROM THE GUN TO THE CAR. (TOMMY)>> HEY, I HOPE YOU GUYS ARE READY TO SEE US START SPRAYING ON OUR COPO CAMARO. SHE'S IN THE BOOTH ALL MASKED UP AND WE'RE READY TO START HITTING IT WITH SOME OF OUR BARRETT JACKSON RESTORATION SYSTEM PRIMER. ALWAYS REFER TO THE DATA SHEET ON HOW TO USE THE SYSTEM PROPERLY. WE'RE GONNA BE USING THE BARRETT JACKSON EPOXY PRIMER, WHICH HAS AN ACTIVATOR AND HAS PLENTY OF BUILD TO ALLOW US TO STRAIGHTEN UP OUR CAR WHERE NEEDED. ONTO THE CAR BEFORE IT LOSES THE ABILITY TO ADHERE. NOW WHENEVER YOU'RE TACKLING SOMETHING LIKE THIS, MAKE SURE THAT YOU USE THE PROPER SAFETY EQUIPMENT LIKE GLOVES, A PAINT SUIT, AND A BREATHING APPARATUS. IT'S RECOMMENDED TO APPLY THIS PRIMER WITHIN A TEMPERATURE RANGE OF 60 TO 85 DEGREES FAHRENHEIT USING 55 TO 65 POUNDS OF PRESSURE IN A CONVENTIONAL GUN. YOU WANT TO APPLY TWO OF THE THREE COATS SPRAYING ABOUT FIVE TO SEVEN INCHES AWAY FROM THE SURFACE. AFTER ABOUT 90 MINUTES WE CAN SCUFF IT OR SAND IT ONE LAST TIME TO GIVE OUR COLOR MAXIMUM ADHESION. ACTUALLY KINDA CREATING THESE GROOVES. AND WHENEVER YOU PAINT OVER TOP OF THEM, ESPECIALLY WHENEVER YOU'RE USING A METALLIC COLOR, YOU'RE GONNA RUN INTO ISSUES WITH THE METALLICS LOOKING ALL KIND OF CRAZY AND STUFF AND ACTUALLY FOLLOWING EVERY STROKE THAT YOU SAND. BUT IF YOU'RE USING A SOLID COLOR LIKE A BLACK, BLUE, GREEN, WHATEVER WITH NO METALLICS IN IT, YOU USUALLY DON'T RUN INTO THAT KIND OF ISSUE. NOW WITH DRY SANDING I DON'T MIND IT BECAUSE YOU GET TO SEE WHERE YOU'RE AT DURING THE SANDING PROCESS. BUT WHENEVER YOU WET SAND, A LOT OF TIMES THIS STUFF MAKES A BIG GNARLY MESS. BUT WHEN WET SANDING THE WATER FLUSHES OUT ALL THE POWDERED UP STUFF OUT OF THE PAPER AND ALLOWS IT CUT REALLY QUICKLY BUT IT IS A LOT MORE MESSY. (ANNOUNCER)>> STILL AHEAD, IT'S A LESSON ON THE LOGISTICS OF BUFFING YOUR CLEAR COAT. PROTECTION AS WELL. BEING ABLE TO COME BACK AND BUFF OUT THE FINISH OF A CAR IS ONE OF THOSE THINGS THAT REALLY TAKES A JOB UP TO THE NEXT LEVEL. AND A FEW GOOD COATS OF CLEAR WILL GIVE US AMPLE MATERIAL TO DO SO. WHEN YOU APPLY THIS CLEAR OVER THE TOP OF SINGLE STAGE PAINT, IT NEEDS TO HAPPEN WITHIN 24 HOURS OF WHEN THE PAINT IS APPLIED. OR YOU CAN COME BACK AND SCUFF THE COLOR WITH A GREY SCUFF PAD BEFORE CLEARING IT. USE 50 TO 60 PSI WITH A CONVENTIONAL GUN SPRAYING AT EIGHT TO 10 INCHES. YOU ALSO WANT TO ALLOW TWO TO FIVE MINUTES BETWEEN COATS. AFTER 24 HOURS THE CLEAR IS READY TO BE BUFFED USING THE BARRETT JACKSON RESTORATION SYSTEM. I'M GONNA GO AHEAD AND TAPE OFF PART OF THE HOOD SO THAT I CAN SHOW YOU A COMPARISON. WE'LL START WITH ONE OF THESE 1,500 GRIT ABRASIVE DISCS AND WET SAND THE SURFACE WITH MILD DETERGENT AND WATER. MAKE SURE THAT YOU'RE WORKING ON A CLEAN SURFACE SO THAT YOU DON'T ACCIDENTALLY SCRATCH IT UP. AFTER THAT WE CAN SWITCH OVER TO THE 2,000 GRIT AND GO BACK OVER IT. BURNING THROUGH ON AN AREA. NOW WHENEVER YOU'RE BUFFING AN EDGE I ALWAYS LIKE TO BUFF OFF OF THE EDGE NOT ONTO THE EDGE. REFERRING TO THE ROTATION OF THE BUFFING WHEEL, YOU WANT TO MAKE SURE THAT THE WOOL PAD IS RUNNING OFF OF IT BECAUSE WHENEVER IT TRIES TO BUFF ONTO IT, IT ALWAYS BUNCHES UP. THERE'S A REAL GOOD CHANCE YOU'RE FIXING TO MESS UP BAD. PREPARED TO SPEND SOME TIME. WE'RE JUST GOING OVER THIS LITTLE BITY PIECE OF THE HOOD RIGHT NOW TO SHOW YOU HOW MUCH YOU CAN CHANGE THE LOOK OF THE PAINT. BUT DOING THE WHOLE CAR TAKES A PRETTY SIGNIFICANT AMOUNT OF MAN POWER. IS IT WORTH IT? WELL HEY, WE'LL LET YOU BE THE JUDGE OF THAT. (STEVE)>> NOW THE JURY IS STILL OUT ON WHETHER OR NOT THEY ACTUALLY MADE ANY BLACK ZL ONE COPOS. BUT FROM WHAT WE CAN TELL, IF THEY DIDN'T THEY SURE SHOULD HAVE. IF YOU'VE GOT ANY QUESTIONS ABOUT ANYTHING YOU SAW ON THE SHOW TODAY.